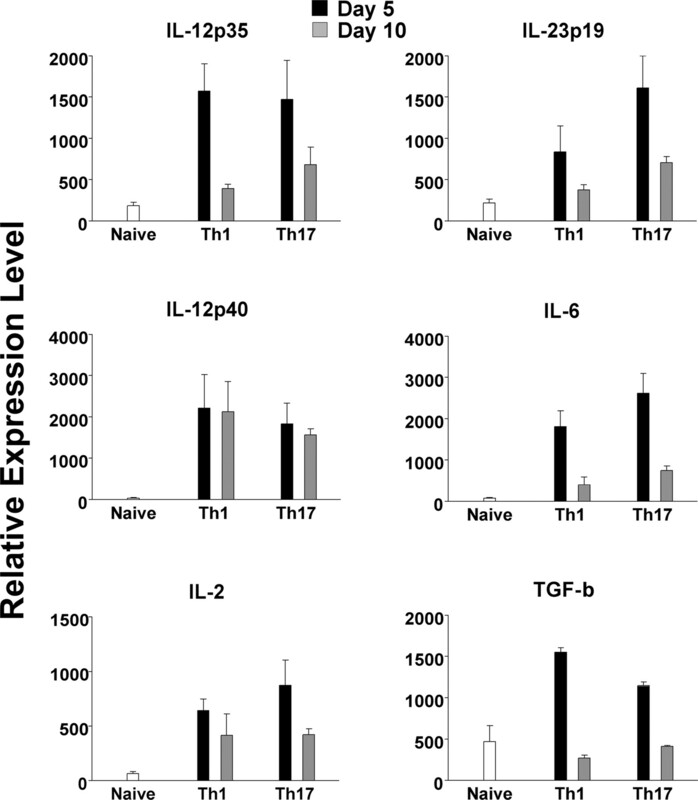 Th1 and Th17 cells are characterized by their expression of IFN-γ or IL-17, respectively. The finding of Th cells producing both IL-17 and IFN-γ suggested, however, that certain Th cells may modify their selective cytokine expression. In this study, we examined changes in cytokine expression in an experimental system in which polarized Th1 or Th17 cells specific against hen egg lysozyme induce ocular inflammation in recipient mice expressing hen egg lysozyme in their eyes. Whereas only IFN-γ was expressed in eyes of Th1 recipient mice, substantial proportions of donor cells expressed IFN-γ or both IFN-γ and IL-17 in Th17 recipient eyes. The possibility that nonpolarized cells in Th17 preparations were responsible for expression of IFN-γ or IFN-γ/IL-17 in Th17 recipient eyes was contradicted by the finding that the proportions of such cells were larger in recipients of Th17 preparations with 20–25% nonpolarized cells than in recipients of 35–40% preparations. Moreover, whereas incubation in vitro of Th1 cells with Th17-polarizing mixture had no effect on their phenotype, incubation of Th17 with Th1-polarizing mixture, or in the absence of cytokines, converted most of these cells into IFN-γ or IFN-γ/IL-17-expressing cells. In addition, Th17 incubated with the Th1 mixture expressed T-bet, whereas no ROR-γt was detected in Th1 incubated with Th17 mixture. 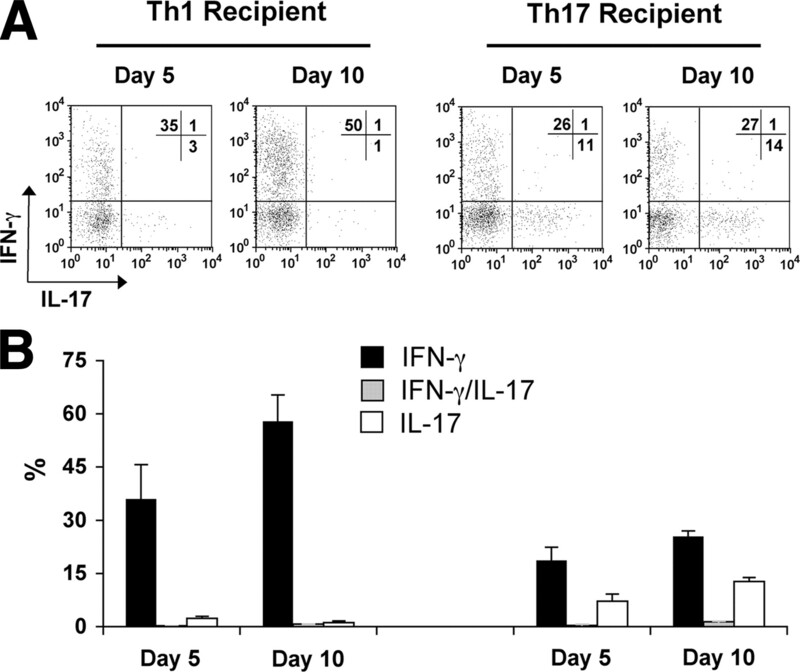 Thus, polarized Th1 cells retain their phenotype in the tested systems, whereas Th17 may switch to express IFN-γ or IFN-γ/IL-17 following activation in the absence of cytokines, or exposure to certain cytokine milieus at the inflammation site or in culture. Studies of recent years have identified a new lineage of Th cells, designated Th17, and have established the pivotal role of this cell lineage in various immunopathogenic processes (1, 2, 3, 4, 5, 6, 7), as well as in defense against certain microbes (8, 9, 10). Th17 cells selectively produce IL-17, and the expression of this cytokine is used to identify these cells and differentiate them from IFN-γ-producing Th1 cells, or IL-4-producing Th2 cells. Flow cytometric analyses of mixed cell populations revealed, however, that in addition to the distinct populations of cells producing either IFN-γ or IL-17, many Th cell suspensions also include a population of double-positive cells that express both cytokines. Double-positive Th cells were identified among both human (11, 12) and murine Th cells (13, 14), but little is known about their cellular origin, mechanism of development, or function. The availability of TCR transgenic (Tg)3 mice made it possible to generate lineages of Th cells specific against the same Ag and to analyze their biological activities (15, 16, 17). We have previously generated lines of Th1 and Th2 cells specific against hen egg lysozyme (HEL) and shown that cells from these lines induce ocular inflammation when adoptively transferred into recipient mice expressing HEL in their eyes (17, 18, 19). Published information concerning culture conditions that induce naive CD4 cells to acquire a Th17 phenotype (9, 20) allowed us to generate polarized HEL-specific Th17 lines and to compare them with Th1 lines. Both Th1 and Th17 induced ocular inflammation, but differed in several key biological activities (21). Using this experimental system, we analyzed in this study the retention of lineage phenotype by Th1 and Th17 cells during the process of inflammation induction by either one of the two lineages. Striking differences were noted between the two lineages, with all Th1 cells retaining their phenotype in the inflamed eye, whereas substantial portions of donor cells in eyes of recipients of Th17 cells expressed IFN-γ, or both IL-17 and IFN-γ. Furthermore, Th1 retained their phenotype even when cultured in the presence of Th17-polarizing mixture, whereas the majority of cells in Th17 preparations cultured in Th1-polarizing mixture, or activated in the absence of polarizing cytokines, became double positive or expressed IFN-γ. In addition, the cultured Th17 preparations expressed the Th1-specific transcription factor T-bet. Our data thus shed new light on the origin of double-positive Th cells, showing they do not originate from Th1 cells and indicating their origin could be from Th17 cells. Tg mice expressing membrane-associated HEL in the lens under control of the αA-crystallin promoter, on an FVB/N background, were generated, as described (22). HEL-specific TCR-Tg mice (designated 3A9), on a B10.BR background, were a gift from M. Davis (Stanford University, Stanford, CA). Tg mice from each line were mated to produce (FVB/N × B10.BR)F1 hybrids that express HEL or HEL-specific TCR, or both, or neither transgene. F1 hybrids containing the 3A9 TCR gene (3A9) were used as donor cells, whereas F1 mice expressing HEL in their lens (HEL-Tg) were used as recipients. F1 hybrid mice expressing neither gene were used as donors for APC. All manipulations were performed in compliance with the National Institutes of Health Resolution on the Use of Animals in Research. IL-6 and TGF-β were from R&D Systems; IL-1α was from PeproTech; IL-2 was from Midwest Medical; anti-IFN-γ (R4-6A2) was from Harlan Bioproducts for Science; anti-IL-4 (11B11) was from National Cancer Institute-Frederick Biological Resources Branch Preclinical Repository; and both IL-12 and HEL were purchased from Sigma-Aldrich. The following reagents were purchased from BD Biosciences: anti-IL-2, anti-IL-12, anti-CD4 FITC or PE-Cy7, anti-IL-17 PE, anti-IFN-γ allophycocyanin, and isotype controls IgG. A clonotypic mAb specific for the TCR of 3A9 mice, designated 1G12, a gift from E. Unanue (Washington University St. Louis, MO), was conjugated with FITC. T cells were enriched from splenocytes and lymph node cells of 3A9 mice, using T cell columns (R&D Systems). CD4+ T cells were isolated using MACS microbeads (Miltenyi Biotec). CD4+ T cells, at 25 × 104/ml, were incubated for 3 days in RPMI 1640 with 10% FCS, 2 μg/ml HEL, and irradiated APC, at 25 × 105/ml, in either Th1-polarizing conditions (10 ng/ml IL-12, 10 μg/ml anti-IL-4) or Th17-polarizing conditions (3 ng/ml TGF-β, 10 ng/ml IL-6, 5 ng/ml IL-1α, 10 μg/ml anti-IL-4, 10 μg/ml anti-IL-12, and 20 μg/ml anti-IFN-γ). In some experiments, as indicated, anti-IL-2, at 10 μg/ml, was also added to the activation mixture for Th17 cells to increase the percentage of IL-17-expressing cells, as shown by Laurence et al. (23). Th17 preparations generated without anti IL-2 were designated Th17 I, and those with the Ab, Th17 II. Th1 and Th17 cell preparations at this activated stage were examined for their activities, or underwent a second cycle of polarization/reactivation as follows: first, the cells were expanded in the presence of 40 IU/ml IL-2 for 4 days with daily 1 ml medium changes. Then, cells were harvested and replated for 3 days of reactivation with 2 μg/ml HEL, APC, and either 10 ng/ml IL-12 plus 40 IU/ml IL-2 for Th1 cells or a cytokine-Ab mixture for Th17 cells (10 ng/ml IL-23, 3 ng/ml TGF-β, 10 ng/ml IL-6, 5 ng/ml IL-1α, 40 IU/ml IL-2, and 20 μg/ml anti-IFN-γ). Polarized 3A9 Th1 or Th17 cells were harvested on day 3 of activation or reactivation and resuspended in RPMI 1640, and 5 × 106 Th1 or Th17 cells were injected via the tail vein into groups of five naive HEL-Tg mice. On days 5 or 10 postadoptive transfer, eyes of recipients were collected, dissected, and digested in RPMI 1640 medium containing 10% FCS, 1 mg/ml collagenase D (Roche), and deoxyribonuclease I (Sigma-Aldrich) for 2 h. Following digestion, ocular cells were mechanically dissociated and filtered. The single ocular cell suspensions were used for flow cytometric analysis. Preparations of polarized/reactivated Th1 and Th17 cells were incubated for 4 additional days in the presence of 40 IU/ml IL-2 with daily 1 ml medium changes. The cells were then washed and cultured in medium containing HEL and APC, alone or with individual cytokines, as indicated, or with the mixture used for reactivation of the opposite lineage, i.e., Th1 cells were incubated with the Th17 mixture and Th17 cells with the Th1 mixture. Following incubation for 3 or 7 days, the cell preparations were analyzed for intracellular cytokine expression and expression of T-bet and ROR-γt mRNA transcripts, as described below. The new cell preparations following incubation with the opposite mixture were designated Th1/17 and Th17/1. Conventional methods were used for analysis of surface molecule expression. For intracellular staining, Th1 and Th17 cell cultures and the isolated single ocular cells were stimulated with 20 ng/ml PMA and 1 μM ionomycin (Sigma-Aldrich), plus Golgi-Stop (BD Biosciences), for 5 and 4 h, respectively. The stimulated Th1 and Th17 cells were then stained for surface CD4 (FITC) and intracellular IFN-γ (allophycocyanin) and IL-17 (PE), whereas the stimulated ocular cells were stained for surface CD4 (PE Cy7) and Tg-TCR (1G12; FITC) and intracellular IFN-γ (allophycocyanin) and IL-17 (PE). The stained cells were analyzed using a BD FACSCalibur. Flow cytometric analysis of all cultured cells was conducted by gating on CD4+ cells, whereas analysis of cells isolated from recipient eyes was performed by gating on CD4+1G12+ or CD4+1G12−, as indicated. Total RNA was extracted from cultured cells or recipient eyes with TRIzol (Invitrogen-Life Technologies). RNA (10 μg), SuperScript III Reverse Transcriptase (Invitrogen Life Technologies), and oligo(dT)12–16 were used for first-strand cDNA synthesis. Primer-probe sets for real-time PCR quantifying expression of mouse T-bet, IL-12, IL-23, and GAPDH or β-actin (internal control) were purchased from Applied Biosystems. Primers used for ROR-γt (a gift from C. Egwuagu, National Eye Institute, National Institutes of Health, Bethesda, MD) and ROR-α are as follows: ROR-γt, 5′-CCGCTGAGAGGGCTTCAC-3′ and 5′-TGCAGGAGTAGGCCACATTACA-3′; ROR-α, 5′-CGTGTCCATGGCAGAACTAGAA-3′ and 5′-GCAAGTACTGGCAGGTTTCCA-3′. Fluorescence-labeled probes used are: ROR-γt, 5′-AAGGGCTTCTTCCGCCGCAGCCAGCAG-BHQ-1–3′; ROR-α, 5′-CCTTGCCCAGAACATATCCAAATCCCA-BHQ-1–3′. PCR parameters were as recommended for the TaqMan Universal PCR master mix kit (Applied Biosystems). Recipient eyes were collected on days 5 and 10 postcell transfer and processed for histological analysis by H&E staining, using conventional methods. Using two cycles of polarization/activation, as detailed in Materials and Methods, we generated lines of Th1 and Th17 cells expressing HEL-specific TCR. Almost all reactivated cells of both lineages expressed this TCR, identified by the 1G12 clonotypic Ab (Fig. 1⇓A). 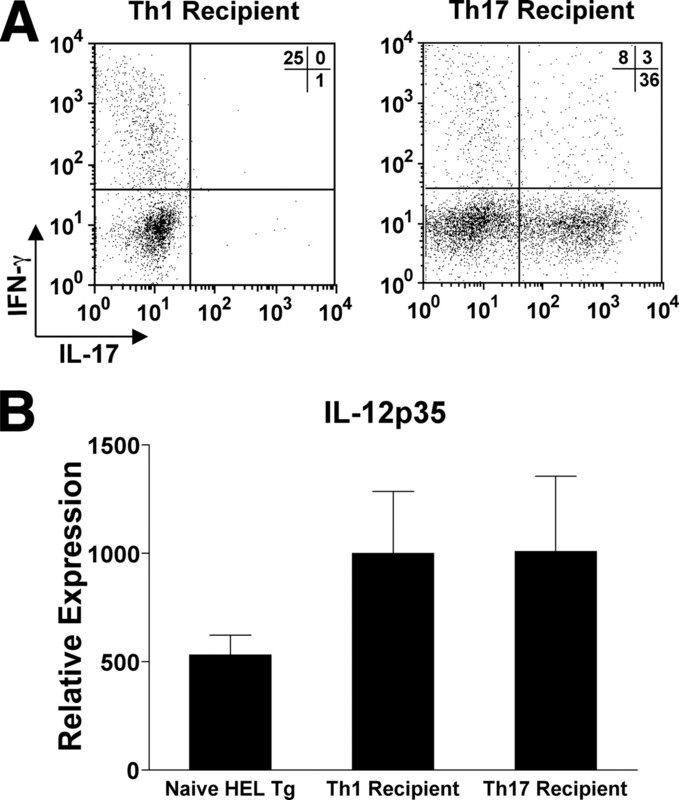 The polarity of the two lines was verified by their release of either IFN-γ or IL-17 into the culture supernatants (21) (data not shown) and the selective intracellular expression of these two cytokines (Fig. 1⇓B). The two cell lineages also included miniscule proportions of cells that expressed both IFN-γ and IL-17 (∼2%). Features of polarized/reactivated Th1 and Th17 cells. A, Flow cytometric analysis showing that the great majority of polarized/reactivated Th1 and Th17 cells are 1G12 positive. The gray traces are isotype controls. B, Expression of intracellular IFN-γ or IL-17, just before adoptive transfer to recipients, determined by flow cytometry. All cytometric analyses included in this figure were conducted by gating on CD4+ cells. C, Typical histological ocular changes in the posterior segment of HEL-Tg recipients injected with 5 × 106 3A9 polarized/reactivated Th1 or Th17 cells, 5 or 10 days postcell transfer. Also shown is a section of a naive control eye. Tissues included in the figure are portions of the lens (Le), vitreous (Vi), and retina (Re) surrounding the optic nerve. Heavy cellular infiltration in all eye tissues, in both Th1 and Th17 recipient eyes, with partial subsiding on day 10 in the Th1 recipient eye. When injected into recipient mice expressing HEL in their lens, reactivated cells of both lineages produced ocular inflammation. Fig. 1⇑C depicts the typical inflammatory changes in recipients injected with 5 × 106 cells of either Th1 or Th17, at 5 or 10 days postcell injection. The eye segment selected for this figure includes portions of the lens, vitreous, and retina surrounding the optic nerve head, the point of entry for a major portion of the inflammatory cells that invade the eye in recipient mice (24). Heavy infiltration of inflammatory cells is seen in the optic nerve head, retina, and vitreous of both Th1 and Th17 recipient eyes. It is of note that, as seen in this figure, the inflammation intensity in Th1 recipients was usually lower on day 10 than on day 5, whereas no such decrease was routinely observed in Th17 recipient eyes. Similar histopathological changes were observed in eyes of recipients injected with activated cells, which underwent only one cycle of activation/polarization in culture (data not shown). Tracking the injected cells by CFSE and the clonotypic Ab 1G12 revealed that Th1 cells divided remarkably faster than Th17 in the recipient mouse, but the rate of death of Th1 cells in recipient eyes was also greater than that of Th17. The enhanced cell death by Th1 is assumed to be responsible in part to the fast decline in inflammation level in eyes of Th1 recipients (G. Shi, B. P. Vistica, M. Ramaswamy, C. Tan, E. F. Wawrousek, R. M. Siegel, and I. Gery, manuscript in preparation). This experimental system thus made it possible for us to analyze the expression of IFN-γ and IL-17 by donor and host cells in eyes of the recipient mice, at different time points following transfer. Using the clonotypic 1G12 Ab, we were able to identify the donor T cells in inflamed eyes of recipient mice and to analyze them for expression of IFN-γ and/or IL-17, on days 5 and 10 postcell transfer. Flow cytometric analysis was conducted by gating on donor cells, positive for both CD4 and the clonotypic Ab 1G12. Fig. 2⇓ shows data collected with Th1 preparations containing >90% IFN-γ-positive cells (Fig. 2⇓A) and two types of Th17 preparations, with IL-17 being expressed by 60–65% (preparations I; Fig. 2⇓B) or 75–80% of the population (preparations II; Fig. 2⇓C). The preparations with higher percentage of Th17 were generated by adding anti-IL-2 Ab to the initial activation/polarization mixture (see Materials and Methods). Data collected with both types of preparations are presented in this study to demonstrate that the fraction of nonpolarized cells, which do not express IL-17, has little effect on the phenotype switch observed with the Th17 cells. Phenotype retention by Th1 and switching by Th17 cells in eyes of recipient mice. Polarized/Reactivated Th1 (A) or Th17 (B and C) from 3A9 donors were injected into HEL-Tg mice, and eyes of the recipients were collected 5 or 10 days later for intracellular staining of IFN-γ and IL-17. Th17 preparations were generated without (I) or with (II) anti-IL-2 Ab (see Materials and Methods for more detail). Left panels, Show representative experiments with the tested Th preparations, whereas the panels at the right summarize data of three repeated experiments with each of these preparations. The preparations used for the representative experiments contained 95% Th1, 60% Th17 I, and 75% Th17 II. The summary columns are mean percentage values ± SEM. The three pairs of panels on the left of Fig. 2⇑ depict flow cytometric data of representative experiments, whereas the panels on the right summarize the mean values ± SEM of these and two other experiments with each of the tested cell preparations. The yield of donor cells from Th1 recipient eyes collected on day 10 was remarkably lower than the yield collected on day 5 (mean values of 21.6 ± 8.0 vs 7.1 ± 1.2 × 103 per eye). In contrast, eyes of Th17 recipients yielded similar levels of donor cells when tested at the two time points (25.1 ± 7.8 vs 33.0 ± 6.0 × 103 per eye). The decrease in number of donor cells in Th1 recipient eyes on day 10 is in line with the reduction in inflammation severity in these eyes, mentioned above, as well as with our previous observation, that Th1 donor cells efficiently recruit host cells and quickly become the minority among infiltrating cells in these eyes (19). Profound differences were found between the two cell lineages. Whereas essentially no IL-17-expressing cells were detected in eyes of Th1 recipients, considerable proportions of transferred cells in Th17 recipient eyes expressed IFN-γ, or were double positive, expressing both IFN-γ and IL-17. The data also show that the proportions of double-positive cells in eyes of Th17 recipients were remarkably higher on day 10 than on day 5, suggesting the development of these cells is an ongoing process in the inflamed eye. Smaller changes were seen in the level of cells expressing IFN-γ in Th17 recipients examined on days 5 or 10 postcell injection. An important observation is that the levels of double-positive cells or cells expressing IFN-γ in eyes of recipients injected with Th17 preparations I were lower than those in recipients of Th17 II cells. Th17 I preparations contained 35–40% nonpolarized Th cells, whereas preparations II contained only 20–25% nonpolarized cells. The finding that more cells were found to switch phenotype in eyes of recipients injected with less nonpolarized cells indicates, therefore, that nonpolarized cells in these Th17 preparations are likely not to play a major role in this phenotype alteration phenomenon. Polarization of Th cells is determined by the cytokine milieu during activation. Adoptively transferred Th cells undergo reactivation in the recipient eye (24), and our finding of phenotype switching in Th17 recipient eyes suggested, therefore, that cytokines in these eyes could be responsible for this acquisition of new phenotypes. To determine cytokine expression in recipient eyes, we measured by quantitative PCR the transcript levels of six cytokines, IL-12p35, IL-23p19, IL-12p40, IL-6, IL-2, and TGF-β. As shown in Fig. 3⇓, levels of all tested transcripts increased remarkably in inflamed eyes of both Th1 and Th17 recipients, with expression levels of most cytokines being higher on day 5 than on day 10 postcell transfer. Notably, relatively small differences were observed between eyes of Th1 and Th17 recipients in expression levels of the various cytokine transcripts, and of particular interest is the similarity between the levels of IL-2 and IL-12 in eyes of the two groups. These two cytokines are the only cytokines in the polarization mixture for Th1 lineage, and their high levels in Th17 recipient eyes suggested they could have been involved in the phenotype switching in these eyes. Expression of cytokine transcripts in recipient eyes of Th1 or Th17 cells. RNA samples were extracted from recipient eyes 5 or 10 days following adoptive transfer of 5 × 106 polarized/reactivated cells and were analyzed by quantitative PCR. The recorded data are means ± SEM of three or four repeated experiments, with five mice per group. To examine the hypothesis that Th17 cells might change their phenotype following exposure to IL-2 and IL-12 in inflamed recipient eyes, we tested in vitro reactivated/polarized cells from the two lineages for their behavior pattern following incubation in the polarizing conditions used for the other lineage. Thus, Th17 cells were cultured for 3 days with IL-2 and IL-12, whereas Th1 cells were cultured with IL-2, IL-23, TGF-β, IL-6, IL-1α, and anti IFN-γ Ab. As seen in Fig. 4⇓, striking differences were found between the two lineages. 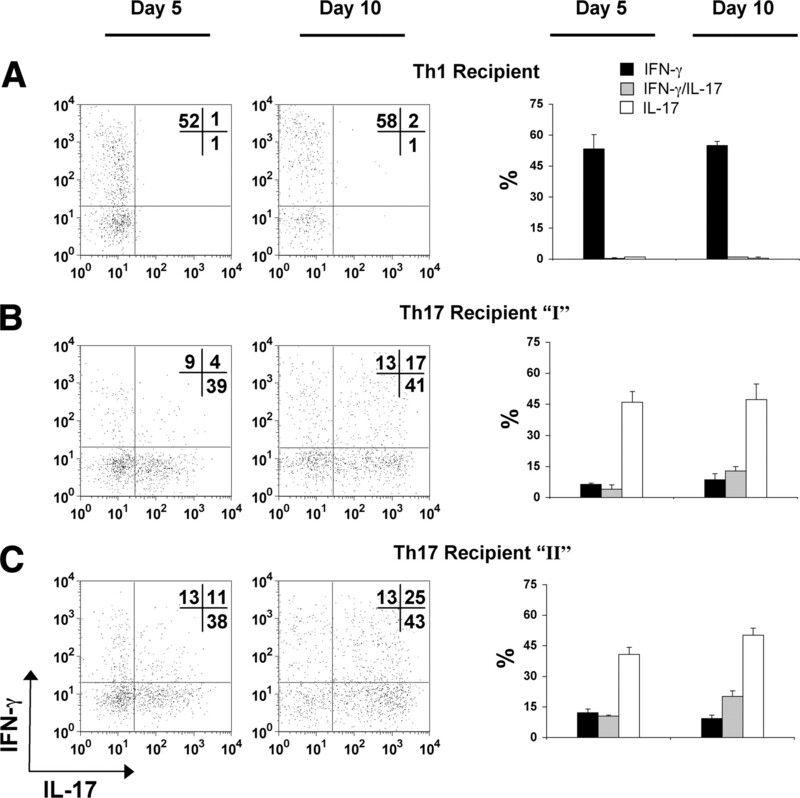 Whereas no phenotype change could be detected in Th1 cells following incubation in the Th17 mixture (Th1/17), Th17 cells cultured in the Th1 mixture (Th17/1) exhibited profound changes that included expression of IFN-γ, or both IFN-γ and IL-17 by the majority of cells, with only a minority of these cells retaining their original Th17 phenotype. Phenotype retention by Th1 and switching by Th17 cells following incubation with the polarizing mixture of the opposite lineage. A and B, Show a representative experiment in which preparations of polarized/reactivated Th1 cells were incubated for 3 days with the polarizing mixture used for Th17 (cell preparations designated Th1/17), whereas Th17 cells were incubated with the mixture used for Th1 polarization (designated Th17/1). The flow cytometric analysis of the original cell preparations is shown in A, whereas the analysis of cells following the additional incubation is depicted in B. C, Summarizes data of four experiments, with the columns representing mean values ± SEM of percentage of cells staining, as indicated. Incubating activated Th17, collected following a single cycle of polarization/activation, with the Th1-polarizing mixture reduced sharply the percentage of IL-17-expressing cells and increased the proportion of nonpolarized and of IFN-γ-producing cells (data not shown). Because the expression of signature cytokines of Th1 and Th17 is determined by transcription factors specific to these lineages, T-bet for Th1 and ROR-γt for Th17 (25, 26), we measured by quantitative PCR the mRNA levels of these transcription factors in Th1 and Th17 cells before and after incubation with the alternative lineage-polarizing mixtures. The data of repeated experiments are summarized in Fig. 5⇓. Cells of the two lineages at the reactivated stage expressed the corresponding transcription factor nearly exclusively. 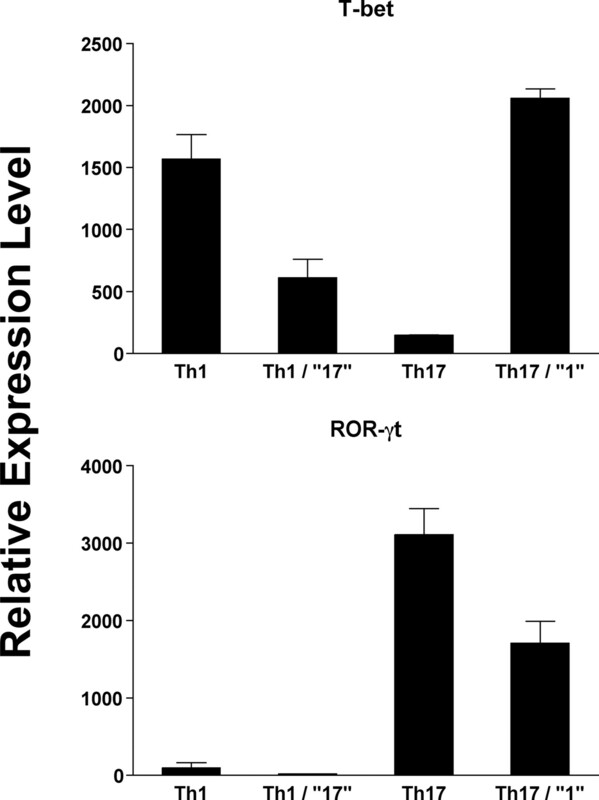 Incubation with the Th17 mixture reduced the expression of T-bet transcript by Th1 cells, but did not induce expression of ROR-γt transcript by these cells. In contrast, Th17 cells incubated with the Th1 mixture expressed high levels of T-bet transcript, along with moderately reduced ROR-γt transcript. Another retinoic acid receptor-related orphan receptor, namely ROR-α, was also found to be involved in the differentiation of Th17 (27, 28). We examined, therefore, the expression of ROR-α in Th1 and Th17 before and after incubation with the corresponding or opposite mixtures. The expression pattern of this transcription factor resembled that of ROR-γt, with the exception that Th1 cells expressed low levels of ROR-α (data not shown). Transcript expression of T-bet and ROR-γt by Th1 and Th17 following polarization/reactivation by the corresponding or opposite mixtures. RNA samples were extracted after 3 days incubation with the indicated mixture and analyzed by quantitative PCR. The recorded data are means ± SEM of three experiments. In view of the striking changes in cytokine production by Th17, but not by Th1 cells, when activated in the presence of the opposite mixture, we further examined the phenotype retention of the two populations in culture. First, we incubated reactivated cell preparations in complete medium enriched only with IL-2 for 1 wk and analyzed their intracellular cytokine production. No change in cytokine production profile was seen with Th1 (data not shown), whereas a proportion of Th17 became double positive, expressing both IFN-γ and IL-17 (Fig. 6⇓A). Phenotype switching and retention by Th17 cells are determined by the cytokine environment. Cultures of polarized/reactivated Th17 were incubated at different conditions, and their cytokine profiles were analyzed by flow cytometry. All data are presented as flow cytomeric analysis of representative experiments, along with graphs that summarize means ± SEM of intracellular staining in two or three repeated experiments. A, Cultures were incubated for 7 days in complete medium with IL-2 at 40 U/ml. B, Polarized/Reactivated cells were incubated for 4 days with IL-2 containing medium, washed, and activated again for 3 days with APC and HEL, without cytokines (Medium), or with the indicated cytokines at 10 ng/ml. C, Cultures prepared as described in B, but harvested after 7 days of incubation with medium or IL-12. We next examined the phenotype retention by polarized/reactivated Th17 cells following an additional cycle of activation with APC and HEL, without or with added individual cytokines. The flow cytometric data of a representative experiment and a summary of this and two other experiments are depicted in Fig. 6⇑B. Incubation of these Th17 cells with APC and HEL, with no additional cytokines, induced a profound change in their cytokine expression profile, with only a minority of cells retaining the Th17 phenotype and approximately one-third of the cells expressing IFN-γ and another third producing both IFN-γ and IL-17. Addition of IL-2 had no effect on the pattern of cytokine expression of these cells (data not shown), whereas added IL-12 reproduced the cytokine expression profile seen in Th17 cultures activated in the presence of Th1-polarizing mixture, as recorded above (Fig. 4⇑), by shifting larger proportions of cells toward production of IFN-γ. Addition of IL-23, a cytokine that plays a major role in expanding and maintaining Th17 lineages (1, 2, 3), increased the proportion of IL-17-producing cells and reduced the percentages of cells expressing IFN-γ or IFN-γ/IL-17. Furthermore, adding IL-23 to IL-12 neutralized the IL-12 effect by yielding a cytokine profile similar to that induced by activation without cytokines. It is noteworthy that IL-23 and IL-12 were added to these cultures at the same concentration, i.e., 10 ng/ml. Data recorded in Fig. 6⇑B were collected with cells examined after incubation for 3 days. Extending the incubation time to 7 days (Fig. 6⇑C) did not change substantially the cytokine expression profile in cultures activated without added cytokines, but further enhanced the phenotype switching in cultures incubated with IL-12. Thus, the extended incubation with IL-12 increased the proportion of cells expressing IFN-γ and reduced the proportions of cells expressing IL-17 or IFN-γ/IL-17. Incubation of activated Th17 cells (that underwent only one cycle of activation/polarization) with Th17-polarizing mixture increased the proportion of IL-17-expressing cells, whereas incubation with Th1 mixture increased the proportion of nonpolarized cells and induced switching of approximately one-third of these cells to producing IFN-γ (data not shown). Adoptively transferred activated Th cells home to the recipient spleen, where they divide and undergo modifications of their surface marker profile before invading the recipient eye (24). To monitor phenotype retention by transferred Th1 and Th17 cells in recipient spleens, we analyzed by flow cytometry the expression of IFN-γ and IL-17 by cells positive for 1G12, the clonotypic Ab. Fig. 7⇓A depicts a representative experiment and shows that the proportions of cells expressing the signature cytokines among both Th populations were notably small. Similar to observations in recipient eyes, Th1 retained their phenotype and no IL-17 expression was detected in Th1 recipient spleen. In contrast, a small proportion of donor cells in Th17 recipient spleen produced IFN-γ. It is also of interest that only a very low proportion of donor cells in these spleens demonstrated double positivity, a finding in line with that of McGeachy et al. (29) (Fig. 2⇑C). Phenotype retention by donor cells (A) and IL-12 transcript expression in recipient spleen (B). Recipient mice were injected with 5 × 106 Th1 or Th17 cells, and spleens were collected 5 days later for analysis. A, 1G12+ cells were analyzed by flow cytometry for intracellular expression of IFN-γ and IL-17. A representative experiment; similar results were obtained in another experiment. B, RNA extracted from recipient spleens was analyzed by quantitative PCR for IL-12 transcript level; a summary of two independent experiments. In view of the capacity of IL-12 to mediate phenotype switching by Th17 cells, we also examined the expression of IL-12p35 transcript in the two groups of recipient spleens. Data of two experiments are summarized in Fig. 7⇑B and show that the levels of this molecule were similarly higher in spleens of the two recipient groups than in naive control spleens. It is also of note that spleens in recipients of both Th1 and Th17 undergo enlargement (21). A major component of local inflammation is composed of non-Ag-specific lymphoid cells (30, 31), and we have reported elsewhere that large numbers of CD4 host cells are recruited into eyes with Th1-induced inflammation (19). We examined, therefore, populations of host CD4 cells, negative for 1G12, in inflamed eyes of recipient mice for their production of IFN-γ and IL-17 following adoptive transfer of Th1 or Th17 cells. The analysis of host cells (CD4 + 1G12-) in the affected recipient eyes is recorded in Fig. 8⇓ and shows the dominance of IFN-γ production by host cells. The great majority of host cells in Th1 recipients expressed IFN-γ, with only miniscule proportions of cells expressing IL-17. Measurable proportions of host cells expressing IL-17 were found in Th17 recipient eyes, but these IL-17-producing host cells were outnumbered by IFN-γ-expressing host cells in these eyes. It is also of interest that essentially no double-positive host cells were detected in any of these recipient eyes. Expression of IFN-γ or IL-17 by host CD4 cells (1G12−) in the inflamed eyes of Th1 and Th17 recipient mice. A, Flow cytometric analysis of a representative experiment of IFN-γ and IL-17 intracellular expression by host CD4 cells in eyes of recipient mice injected with 5 × 106 Th1 or Th17 cells. B, Mean percent values ± SEM of host CD4 cells expressing IFN-γ, IL-17, or both cytokines in recipient eyes in three separate experiments. 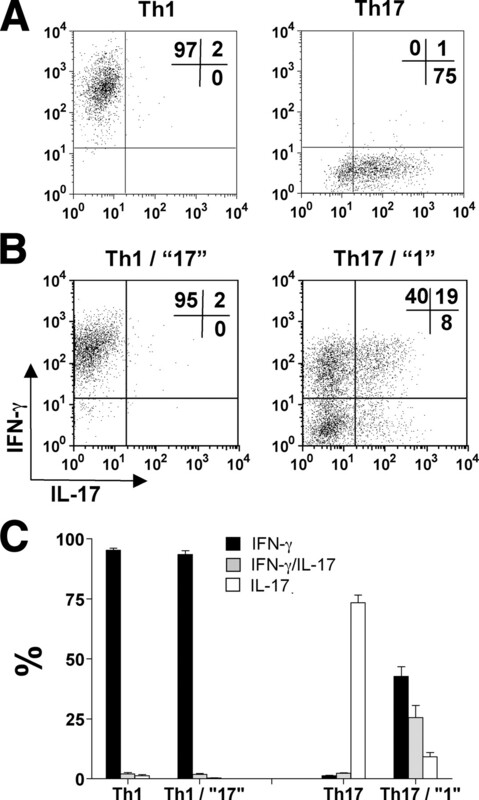 Data recorded in this study provide evidence to show that, when exposed to certain cytokine milieus, Th17 cells may acquire the capacity to express IFN-γ, or both IL-17 and IFN-γ. In contrast, Th1 cells retain their phenotype under all conditions tested in this study, both in vivo and in vitro. In the system we used, in vivo, polarized Th1 or Th17 cells induced ocular inflammation in recipient mice expressing the target Ag, HEL, in their lens. Flow cytometric analysis of donor cells in the inflamed recipient eyes showed that whereas only IFN-γ-expressing cells were detected in eyes of Th1 recipients, portions of donor cells in Th17 recipients were found to produce IFN-γ or both IFN-γ and IL-17. Our preparations of Th17 cells included nonpolarized cells that, in theory, could have been the main source of cells expressing IFN-γ or IFN-γ/IL-17 in the Th17 recipient eyes. We addressed this issue by testing two different Th17 preparations, containing 20–25% or 35–40% nonpolarized cells. Analysis of donor cells in recipient eyes of these two cell preparations showed that the proportions of double-positive or IFN-γ-producing cells were higher in eyes of Th17 recipients injected with the lower portion of nonpolarized cells (Fig. 2⇑). Had nonpolarized cells been the main source of cells expressing IFN-γ or IFN-γ/IL-17, opposite results would have been expected. We concluded, therefore, that nonpolarized cells played a minor role in our observation of newly expressed IFN-γ by donor cells in Th17 recipient eyes. Moreover, the capacity of Th17 cells to change phenotype and express IFN-γ, or both cytokines, was further demonstrated by our finding in vitro, that the majority of Th17 produced IFN-γ, or became double positive, when activated in presence of the Th1-polarizing mixture, or in the absence of cytokines. The proportion of double-positive cells in Th17 recipient eyes increased between days 5 and 10 following cell transfer (Fig. 2⇑), suggesting that this is an ongoing process in which the inflammatory environment in the recipient eye triggers the phenotype switch. This notion concerning the effect of inflammatory environment on Th17 cells is in line with a recent publication by Annunziato et al. (12), reporting remarkably high proportions of Th1/Th17 cells in gut tissue of patients with Crohn’s disease. We assume that the chronicity of the inflammatory process in these patients allowed the accumulation of IFN-γ/IL-17 cells to proportions higher than those found in recipient mice in our study, in which Th17 cells were exposed to the inflammatory environment for just several days. Unlike with double-positive cells, the proportion of cells expressing only IFN-γ in Th17 recipient mouse eyes did not change much between days 5 and 10 postcell transfer (Fig. 2⇑). The relationship between cells expressing IFN-γ and cells expressing both IFN-γ and IL-17 among the donor lymphocytes in Th17 recipient eyes is unclear and requires further investigation. The most revealing data concerning phenotype switching were collected in vitro, in experiments in which polarized Th1 and Th17 cells were cultured with mixtures used for the polarization/reactivation step of the opposite lineage. Strikingly, this treatment in culture did not affect Th1 cells, whereas the majority of Th17 switched to produce IFN-γ, or became double positive, producing both IFN-γ and IL-17 (Fig. 4⇑). As mentioned above, these in vitro data essentially ruled out the possibility that only the small proportion of nonpolarized cells in the Th17 preparations are those that are capable of acquiring the Th1 or double-positive phenotypes. The Th1-polarizing mixture that we use includes only two cytokines, IL-2 and IL-12, and our data showed that this mixture’s effect on Th17 cells is totally due to IL-12. Importantly, however, our data with cultured Th17 cells also revealed the instability of cells of this lineage when stimulated in the absence of the complete Th17-polarizing mixture; addition of IL-23 alone to Th17 cultures was insufficient to fully retain their phenotype (Fig. 6⇑B). Analysis of Th17 recipient eyes showed that these eyes express all cytokines used to polarize Th17, namely, IL-6, TGF-β and IL-23 (Fig. 3⇑). It is conceivable, therefore, that the presence of these three cytokines was responsible for the phenotype retention by the majority of Th17 cells in these recipient eyes; the magnitude of phenotype switching in these eyes (Fig. 2⇑) was remarkably smaller than that observed in culture (Fig. 6⇑). Furthermore, the phenotype switching by Th17 in the recipient eyes could be attributed to the powerful polarizing capacity of IL-12, a cytokine that is also strongly expressed in these eyes (Fig. 3⇑). Our findings concerning the IL-12 effect on murine Th17 in vitro are also in accord with those of Annunziato et al. (12) regarding human Th17 clones. The level of phenotype switching in the human system was, however, remarkably lower than what we observed with the murine cells. The in vitro system also allowed us to examine and confirm the expression of transcription factors specific for these Th lineages, T-bet for Th1 and ROR-γt for Th17 (25, 26), in cultures of these polarized lineage cells (Fig. 5⇑). Our finding that Th17 cells do not express any detectable T-bet is in line with results reported by Veldhoen et al. (32), using Th17 lines developed by two cycles of polarization/activation with anti-CD3 and anti-CD28 and cytokine mixtures. It is of note, however, that low levels of T-bet were detected in preparations of Th17 cells following a less vigorous polarization (33). T-bet was also found to be expressed by human Th17 clones (12). No ROR-γt was detected in Th1 cultures following incubation with the Th17 mixture, but phenotype switching in Th17 cultures was accompanied by expression of T-bet. It is of note that in another study we found that both T-bet and ROR-γt transcripts are expressed in eyes of Th17 recipient mice, whereas only T-bet transcript is expressed in Th1 recipient eyes (C. Tan, G. Shi, B. P. Vistica, E. F. Wawrousek, and I. Gery, unpublished data). The finding of T-bet in Th17 recipient eyes is thus in line with our observation of phenotype switching in these eyes. Cytokine profile analysis of the non-Ag-specific host cells recruited into inflamed eyes of recipient mice revealed the dominance of IFN-γ-producing cells among this population (Fig. 8⇑). The preference toward Th1 phenotype among the host cells could be attributed in part to the strong phenotype retention by Th1, in contrast to the instability of Th17. In addition, Th1 polarization requires only one cytokine, IL-12, as opposed to the need for multiple cytokines for Th17, molecules that could be distributed unevenly in the inflamed eye. The dominance of Th1 cells among recruited host cells also explains the near absence of double-positive cells among this group, because Th1 cells do not switch phenotype. In conclusion, data presented in this study show that substantial proportions of donor cells in inflamed eyes of recipients of Th17 cell preparations express both IFN-γ and IL-17, or only IFN-γ. The possibility that these IFN-γ-producing cells originate from the population of nonpolarized cells in Th17 preparations is contradicted by the findings that: 1) proportions of double-positive cells in recipients of Th17 preparations consisting of only 20–25% nonpolarized cells were larger than those in recipients of 35–40% preparations, and 2) in vitro studies demonstrated the poor phenotype retention by Th17. In contrast to Th17, Th1 cells fully retained their phenotype, in both the in vivo and in vitro systems. We thank Dr. Arian Laurence for very helpful suggestions and critical reading of the manuscript, Dr. Charles E. Egwuagu for the primers-probe set for ROR-γt, R. Steven Lee for tail DNA analysis, and National Eye Institute Histopathology Core for tissue section preparations. ↵1 This work was supported by the Intramural Research Program of the National Eye Institute, National Institutes of Health. ↵3 Abbreviations used in this paper: Tg, transgenic; HEL, hen egg lysozyme. Bettelli, E., M. Oukka, V. K. Kuchroo. 2007. TH-17 cells in the circle of immunity and autoimmunity. Nat. Immunol. 8: 345-350. McKenzie, B. S., R. A. Kastelein, D. J. Cua. 2006. Understanding the IL-23-IL-17 immune pathway. Trends Immunol. 27: 17-23. Weaver, C. T., R. D. Hatton, P. R. Mangan, L. E. Harrington. 2007. IL-17 family cytokines and the expanding diversity of effector T cell lineages. Annu. Rev. Immunol. 25: 821-852. Nakae, S., A. Nambu, K. Sudo, Y. Iwakura. 2003. Suppression of immune induction of collagen-induced arthritis in IL-17-deficient mice. J. Immunol. 171: 6173-6177. Park, H., Z. Li, X. O. Yang, S. H. Chang, R. Nurieva, Y. H. Wang, Y. Wang, L. Hood, Z. Zhu, Q. Tian, C. Dong. 2005. A distinct lineage of CD4 T cells regulates tissue inflammation by producing interleukin 17. Nat. Immunol. 6: 1133-1141. Langrish, C. L., Y. Chen, W. M. Blumenschein, J. Mattson, B. Basham, J. D. Sedgwick, T. McClanahan, R. A. Kastelein, D. J. Cua. 2005. IL-23 drives a pathogenic T cell population that induces autoimmune inflammation. J. Exp. Med. 201: 233-240. Yen, D., J. Cheung, H. Scheerens, F. Poulet, T. McClanahan, B. McKenzie, M. A. Kleinschek, A. Owyang, J. Mattson, W. Blumenschein, et al 2006. IL-23 is essential for T cell-mediated colitis and promotes inflammation via IL-17 and IL-6. J. Clin. Invest. 116: 1310-1316. Kullberg, M. C., D. Jankovic, C. G. Feng, S. Hue, P. L. Gorelick, B. S. McKenzie, D. J. Cua, F. Powrie, A. W. Cheever, K. J. Maloy, A. Sher. 2006. IL-23 plays a key role in Helicobacter hepaticus-induced T cell-dependent colitis. J. Exp. Med. 203: 2485-2494. Liang, S. C., X. Y. Tan, D. P. Luxenberg, R. Karim, K. Dunussi-Joannopoulos, M. Collins, L. A. Fouser. 2006. Interleukin (IL)-22 and IL-17 are coexpressed by Th17 cells and cooperatively enhance expression of antimicrobial peptides. J. Exp. Med. 203: 2271-2279. Khader, S. A., G. K. Bell, J. E. Pearl, J. J. Fountain, J. Rangel-Moreno, G. E. Cilley, F. Shen, S. M. Eaton, S. L. Gaffen, S. L. Swain, et al 2007. 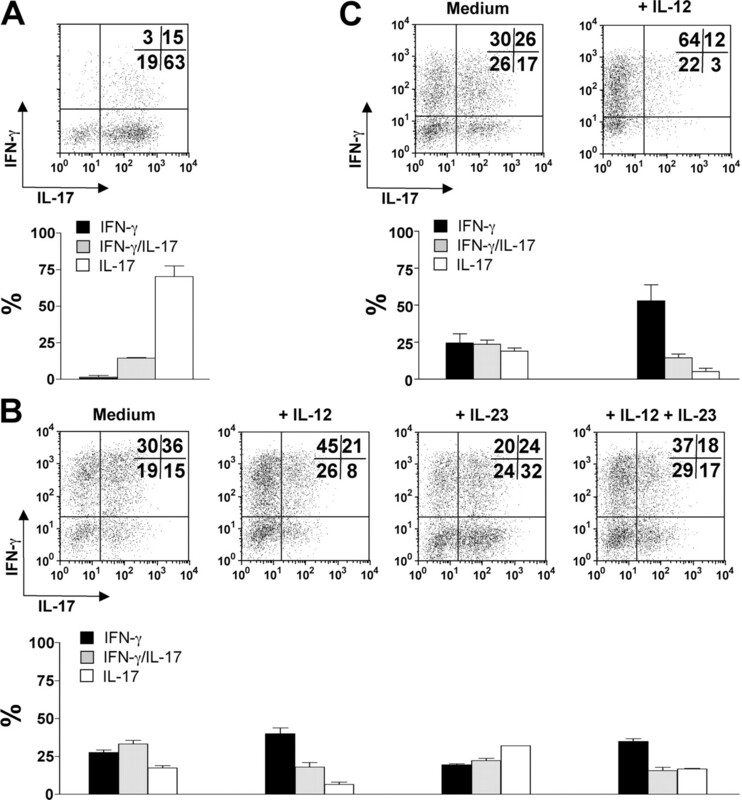 IL-23 and IL-17 in the establishment of protective pulmonary CD4+ T cell responses after vaccination and during Mycobacterium tuberculosis challenge. Nat. Immunol. 8: 369-377. Acosta-Rodriguez, E. V., L. Rivino, J. Geginat, D. Jarrossay, M. Gattorno, A. Lanzavecchia, F. Sallusto, G. Napolitani. 2007. Surface phenotype and antigenic specificity of human interleukin 17-producing T helper memory cells. Nat. Immunol. 8: 639-646. Annunziato, F., L. Cosmi, V. Santarlasci, L. Maggi, F. Liotta, B. Mazzinghi, E. Parente, L. Fili, S. Ferri, F. Frosali, et al 2007. Phenotypic and functional features of human Th17 cells. J. Exp. Med. 204: 1849-1861. Harrington, L. E., R. D. Hatton, P. R. Mangan, H. Turner, T. L. Murphy, K. M. Murphy, C. T. Weaver. 2005. Interleukin 17-producing CD4+ effector T cells develop via a lineage distinct from the T helper type 1 and 2 lineages. Nat. Immunol. 6: 1123-1132. Hue, S., P. Ahern, S. Buonocore, M. C. Kullberg, D. J. Cua, B. S. McKenzie, F. Powrie, K. J. Maloy. 2006. Interleukin-23 drives innate and T cell-mediated intestinal inflammation. J. Exp. Med. 203: 2473-2483. Lafaille, J. J., F. V. Keere, A. L. Hsu, J. L. Baron, W. Haas, C. S. Raine, S. Tonegawa. 1997. Myelin basic protein-specific T helper 2 (Th2) cells cause experimental autoimmune encephalomyelitis in immunodeficient hosts rather than protect them from the disease. J. Exp. Med. 186: 307-312. Iqbal, N., J. R. Oliver, F. H. Wagner, A. S. Lazenby, C. O. Elson, C. T. Weaver. 2002. T helper 1 and T helper 2 cells are pathogenic in an antigen-specific model of colitis. J. Exp. Med. 195: 71-84. Kim, S. J., M. Zhang, B. P. Vistica, C. C. Chan, D. F. Shen, E. F. Wawrousek, I. Gery. 2002. Induction of ocular inflammation by T-helper lymphocytes type 2. Invest. Ophthalmol. Visual Sci. 43: 758-765. Foxman, E. F., M. Zhang, S. D. Hurst, T. Muchamuel, D. Shen, E. F. Wawrousek, C. C. Chan, I. Gery. 2002. Inflammatory mediators in uveitis: differential induction of cytokines and chemokines in Th1- versus Th2-mediated ocular inflammation. J. Immunol. 168: 2483-2492. Chen, J., C. Fujimoto, B. P. Vistica, J. He, E. F. Wawrousek, B. Kelsall, I. Gery. 2006. Active participation of antigen-nonspecific lymphoid cells in immune-mediated inflammation. J. Immunol. 177: 3362-3368. Sutton, C., C. Brereton, B. Keogh, K. H. Mills, E. C. Lavelle. 2006. A crucial role for interleukin (IL)-1 in the induction of IL-17-producing T cells that mediate autoimmune encephalomyelitis. J. Exp. Med. 203: 1685-1691. Cox, C. A., G. Shi, H. Yin, B. P. Vistica, E. F. Wawrousek, C. C. Chan, I. Gery. 2008. Both Th1 and Th17 are immunopathogenic but differ in other key biological activities. J. Immunol. 180: 7414-7422. Lai, J. C., A. Fukushima, E. F. Wawrousek, M. C. Lobanoff, P. Charukamnoetkanok, S. J. Smith-Gill, B. P. Vistica, R. S. Lee, C. E. Egwuagu, S. M. Whitcup, I. Gery. 1998. Immunotolerance against a foreign antigen transgenically expressed in the lens. Invest. Ophthalmol. Visual Sci. 39: 2049-2057. Laurence, A., C. M. Tato, T. S. Davidson, Y. Kanno, Z. Chen, Z. Yao, R. B. Blank, F. Meylan, R. Siegel, L. Hennighausen, et al 2007. Interleukin-2 signaling via STAT5 constrains T helper 17 cell generation. Immunity 26: 371-381. Chen, J., B. P. Vistica, H. Takase, D. I. Ham, R. N. Fariss, E. F. Wawrousek, C. C. Chan, J. A. DeMartino, J. M. Farber, I. Gery. 2004. A unique pattern of up- and down-regulation of chemokine receptor CXCR3 on inflammation-inducing Th1 cells. Eur. J. Immunol. 34: 2885-2894. Szabo, S. J., S. T. Kim, G. L. Costa, X. Zhang, C. G. Fathman, L. H. Glimcher. 2000. A novel transcription factor, T-bet, directs Th1 lineage commitment. Cell 100: 655-669. Ivanov, I. I., B. S. McKenzie, L. Zhou, C. E. Tadokoro, A. Lepelley, J. J. Lafaille, D. J. Cua, D. R. Littman. 2006. The orphan nuclear receptor RORγt directs the differentiation program of proinflammatory IL-17+ T helper cells. Cell 126: 1121-1133. Du, J., C. Huang, B. Zhou, S. F. Ziegler. 2008. Isoform-specific inhibition of RORα-mediated transcriptional activation by human FOXP3. J. Immunol. 180: 4785-4792. Yang, X. O., B. P. Pappu, R. Nurieva, A. Akimzhanov, H. S. Kang, Y. Chung, L. Ma, B. Shah, A. D. Panopoulos, K. S. Schluns, et al 2008. T helper 17 lineage differentiation is programmed by orphan nuclear receptors RORα and RORγ. Immunity 28: 29-39. Steinman, L.. 1996. A few autoreactive cells in an autoimmune infiltrate control a vast population of nonspecific cells: a tale of smart bombs and the infantry. Proc. Natl. Acad. Sci. USA 93: 2253-2256. Caspi, R. R., C. C. Chan, Y. Fujino, F. Najafian, S. Grover, C. T. Hansen, R. L. Wilder. 1993. Recruitment of antigen-nonspecific cells plays a pivotal role in the pathogenesis of a T cell-mediated organ-specific autoimmune disease, experimental autoimmune uveoretinitis. J. Neuroimmunol. 47: 177-188. Veldhoen, M., R. J. Hocking, C. J. Atkins, R. M. Locksley, B. Stockinger. 2006. TGFβ in the context of an inflammatory cytokine milieu supports de novo differentiation of IL-17-producing T cells. Immunity 24: 179-189. Mathur, A. N., H. C. Chang, D. G. Zisoulis, G. L. Stritesky, Q. Yu, J. T. O'Malley, R. Kapur, D. E. Levy, G. S. Kansas, M. H. Kaplan. 2007. Stat3 and Stat4 direct development of IL-17-secreting Th cells. J. Immunol. 178: 4901-4907.